Colombian troops flew into a former guerrilla enclave in southern Colombia early Friday, soldiers said. Two hundred soldiers from Colombia's rapid deployment force flew into an abandoned army base aboard 10 U.S.-made Black Hawk helicopters. The move fulfilled a promise by Colombian President Andres Pastrana who had been enraged by the hijacking of a commercial airliner. Pastrana declared peace talks dead and ordered troops back into the enclave, which had been ceded to the 17,000-strong Revolutionary Armed Forces of Colombia, or FARC, in late 1998. The troops encountered no resistance. "We are here to prove to the Colombian people that the bandits are not in control. We came here eager to fight," said soldier Carmona Marin. Residents in San Vicente del Caguan posted white flags at their homes to ward off attack from either side. "The white flags symbolize peace. We don't want anything to happen," said Amelia de Ficaro, 68. Residents did strip six vehicles - abandoned by rebels - along a road outside town. Also left behind was a sign that referred to U.S. anti-drug aid to Colombia. "The gringos give the arms. Colombia provides the dead," it said. 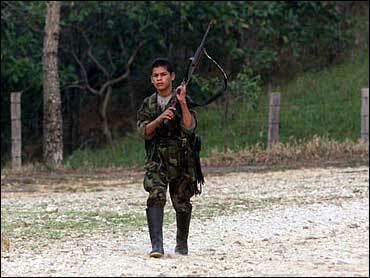 A rebel in camouflage and brandishing an AK-47 rifle manned a checkpoint outside San Vicente del Caguan. "We'll keep patrolling because this is Colombia and we're all over Colombia," he said. He waved through journalists, wishing them "Feliz viaje"  happy trip. The soldiers, armed with assault rifles, grenade launchers and machine guns, stood guard in the abandoned army base about five miles from the cattle town of San Vicente. The town, 175 miles south of Bogota, had its power cut hours before the troops arrived at about 2 a.m.
As dawn broke, soldiers stood guard in a field blackened by a recent fire and patrolled the perimeter of the base. Others began patrolling a road leading into San Vicente, a town of about 22,000 people. Thousands more troops were expected within hours. Leftist rebels were known to be in the jungle and pasture surrounding the town. The base had served as headquarters for a counter-insurgency battalion until the government ceded the Switzerland-sized zone in southern Colombia to the guerrillas in an effort to promote peace talks. It had recently been used as living quarters for government negotiators trying to broker a cease-fire. The soldiers arrived after warplanes and assault helicopters flew nearly 400 sorties, bombarding guerrilla camps, airstrips, roads, supply stations and drug laboratories, the air force said. The 250- and 500-pound bombs began falling Thursday, just hours after President Andres Pastrana  angered by a rebel hijacking of a civilian airliner  broke off peace talks and condemned the rebel Revolutionary Armed Forces of Colombia, known by its Spanish initials, FARC. The government ordered 13,000 troops to advance on the rebel stronghold. On Thursday, three planeloads of counterinsurgency troops laded at an airport in Florencia, a three-hour drive to the west. Late Thursday, State Department spokesman Richard Boucher said the United States "understands and supports" Pastrana's decision to suspend peace talks with the rebels. "We've always expressed our support for President Pastrana," he said. "We've always said these are decisions for him to make." Pastrana ceded the safe zone to the FARC in November 1998 in an effort to bring the 16,000-strong rebel army to the negotiating table. The area is sparsely populated, with about 100,000 people. Many Colombians rallied around Pastrana, whose peace policy had been highly unpopular. "Colombia was generous with the guerrillas, but now there is no way to continue this process," said businessman Sabas Pretelt de la Vega. Pastrana told reporters he still supports a negotiated solution but could not foresee more talks until the FARC demonstrates a sincere desire to achieve peace. He said he decided almost immediately after the hijacking to break off negotiations. "The truth is, we don't understand why they did it," Pastrana said. U.N. Secretary-General Kofi Annan offered his "good offices" to find a political solution and called on all forces to spare civilians. Amnesty International and Human Rights Watch urged the government to prevent right-wing paramilitaries from entering the zone and killing civilians suspected of collaborating with the rebels. Some 3,500 people are killed annually because of the war.